How is the knowledge graph built up? Historically, the term “knowledge graph” is broadly understood to mean a systematic way of searching and linking information. However, now the term “knowledge graph” often refers specifically to the implementation of such a system on Google. For this context and usage, the internet giant has chosen a simple but apt name: the Google Knowledge Graph. When in use, Google’s knowledge graph is displayed alongside the search results and offers additional information about the search query. This means Google can provide the user with plenty of relevant information about his or her search question, reducing the need to visit other websites to get further information. Google introduced the knowledge graph in May 2012. With the advent of the Google “Hummingbird” update in 2013, the knowledge graph functions were expanded, but the basic concept remained unchanged. Its aim was to provide the user with a way to quickly find information about a specific topic without having to click through search results. To achieve this, the knowledge graph uses a so-called “Knowledge Base.” This is a database in which the information is not simply stored on one level but uses knowledge fragments linked to one another at several levels. Google often relies on content from Wikipedia for its knowledge graph, but it also uses data from company websites. By doing this, Google can provide the user with a wide range of information, either directly, or by simplifying the search process. However, the knowledge graph has its limitations because it does not provide data on every topic. Its strengths are focused upon search queries about companies and well-known personalities, and the knowledge graph can often provide answers to simple questions entered into the search field. The knowledge graph can also help with more general searches, but its support is limited to well-known, simple, or very clearly defined terms. 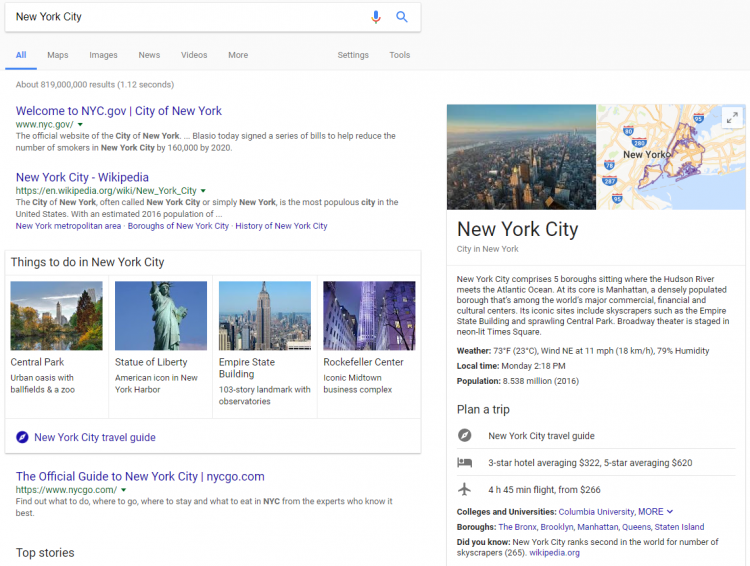 If you search Google using terms such as “Apple Inc” or “New York City,” the knowledge graph will provide additional information. However, if you want to know more about “tax laws in Nevada,” this type of query exceeds the capabilities of this search engine help, and one is then left to depend on the regular search results. The answer box appears above the SERPs, but only if Google can provide the answer to a specific question. For example, in response to the question “How tall is the Eiffel Tower?” after just a second or two we learn that this Parisian landmark rises over 1,000 feet into the sky. Even with more complex questions, such as “How do I change a car tire?” Google contributes a step-by-step guide that makes additional clicks on the search results superfluous. It’s only with a really complex topic, such as a question about how to fill out a tax form, that the search engine is stumped for an answer. This fact has important implications from an SEO and marketing perspective. 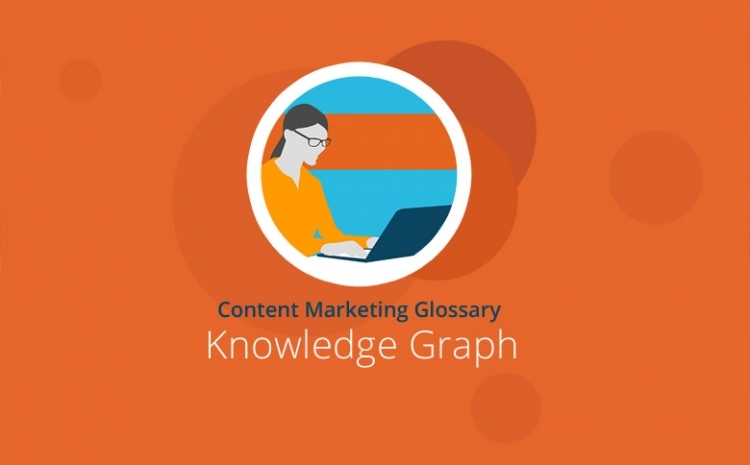 The Knowledge Panel is the “core” of the graph because it is here that – concisely summarized – information about the search term appears. Whether you’re looking for “IBM,” “Bombay” or “William Tell,” Google can help with almost every topic. For these answers, the internet giant is indebted to the online encyclopedia Wikipedia, whose data Google often accesses – a fact that is also important for SEO and online marketing. Which precise information appears in the Knowledge Panel depends on the kind of search queries used. Google evaluates the search term inputs and creates a balanced mix of information. This also reveals the aim Google is pursuing with its knowledge graph: The user should quickly and easily receive information about frequently searched terms. As was feared by many when the knowledge graph was introduced, it seems Google does not want an information website like Wikipedia to grab all this kind of traffic. The carousel is a part of the knowledge graph that does not appear immediately with the search results. Instead, to get to the carousel, a user clicks on one of the links under the answer box or in the knowledge panel under the heading “frequently searched.” A series of pictures that refer to related topics then emerges above the SERPs. Along with the query about the height of the Eiffel Tower, for example, you will also find The Empire State Building, Big Ben, Leaning Tower of Pisa, etc., displayed in the carousel – all famous landmarks of other cities or other places of interest in the world. With the carousel, Google wants to provide further information when the actual information required does not directly appear in the answer box or in the knowledge panel. If you click on one of the pictures in the carousel, Google will automatically start a corresponding query so you can then get matching search results on that new subject in a new knowledge panel. At first glance, the knowledge graph seems a distraction that is likely to interfere with SEO and marketing aims because instead of clicking on the search results, the user gets the information directly from Google – and thus he or she no longer needs to visit a company’s website. Though this is true to some extent, it is still no reason to throw in the towel with developing high-quality content for SEO. Firstly, there is a controversy among experts as to whether the knowledge graph actually loses any relevant traffic. In most cases, anyone who only wants to know how old George Clooney is, or where howler monkeys live, will be gone once he or she gets the required information. And secondly, companies can influence the kind of product or brand information displayed in the knowledge graph. Google often uses Wikipedia as well as the company website – and in both instances the company can influence which topics are addressed, and in what way. Of course, there is no purpose in writing some wild fantasy about the company’s social commitment on Wikipedia because that would be corrected by other users in record time. Nevertheless, the image of a company can be improved through gentle adjustments and the right language. And if the data is presented in a well-structured manner, there is a high probability that it will then flow into the knowledge graph results because these depend on structured data. Therefore, a corresponding optimization along these lines is very worthwhile. In addition, the knowledge graph offers a company the chance to profile itself through content. And since Google now handles very simple queries directly, one should not try to counter this with numerous SEO and marketing measures. Instead, it is best to leave this field largely to Google whilst companies focus on winning users, and perhaps customers, with high-quality content. Google’s knowledge graph is a handy tool for many users to get quick information about simple queries. This threatens to reduce website traffic, but this can be countered with the right measures. Well-structured data on your own website can help to positively influence the information in the knowledge graph, and high-quality content with further information can at least partly offset any lost traffic.